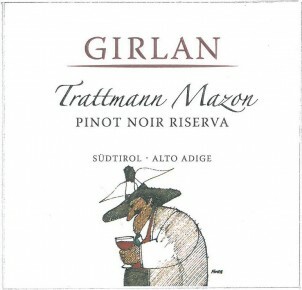 Trattman is the winery’s flagship, award-winning wine: a selection of 100% Pinot Noir sourced from the slopes of the ‘Trattmann’ farm in Mazon, by many regarded as one of the best sites for Pinot Noir in all of Italy. Ruby red in color with slight tones of grenadine. An intense and complex nose with hints of ripe fruit, cherry and maraschino. A soft and delicate palate with a good fruity tannic structure and elegant finish. Pairs well with roasted meats, game, and spicy cheeses. After destemming and gentle pressing, the grapes are taken to steel fermenting vats (100 hl), complete with pumpover system. Maceration on the skins lasts 20 to 25 days. After fermentation (100% malolactic) the wine is aged for 15 months in French barriques and large oak casks (12 hl). It then rests for another 7 months before being placed in the market.